Anchorage | Alaskan at Last! Extreme Earthquake – Even by Alaskan Standards! 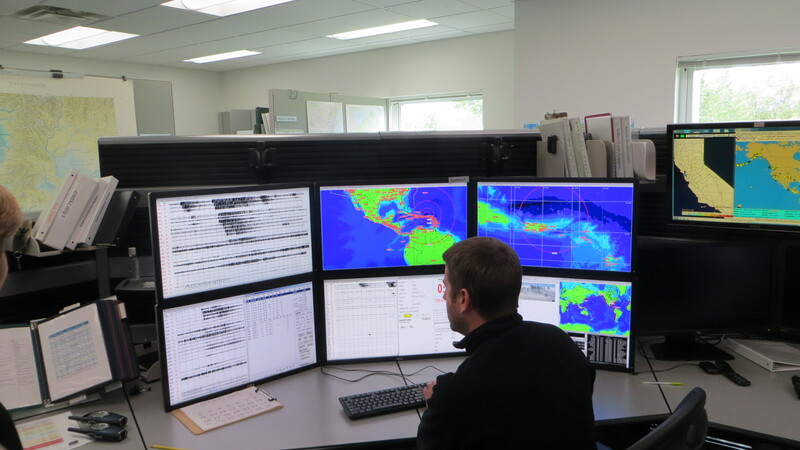 This will be an uncharacteristically brief entry into this blog as I still have a lot of correspondence to answer regarding yesterday’s powerful magnitude 7.0 earthquake. But I wanted to let everyone know we came through the event in relatively good shape owing to the fact we were 100+ miles from the quake’s epicenter which was around 7 miles NW of JBER (Joint Base Elmendorf Richardson); the base is on the northern rim of the Anchorage area. This is not to say we didn’t experience quite an event! At 08:29 I was working at my desk when I felt the initial shudders within the earth that often presage a tremblor; I paused briefly as the dogs ran into the room and clustered about my chair. I glanced at the clock and noted the intensity of the tremblor was still increasing as was the noise. This continued for another 20+ seconds before tapering off. I was actually gripping my desk to stabilize myself and considering getting under it. I had heard lots of loud and unusual noises which I later learned were a couple of shelves collapsing and a number of pictures being knocked off the walls. My damage was minimal and in this I was very lucky; the further south one heads down the Parks Highway (AK 3) the more severe the damage. I spoke to a dear friend in Willow – around 30 miles to the south – perhaps an hour after the main seismic event; she, her husband and her cat were a bit frazzled but safe. However, they have many cracked and broken windows and their power was out. As of Saturday morning I believe this is still the case in much of Willow. Being true Alaskans, they have two generators and thus are able to power their furnace, fridge, water pump and similar while awaiting the restoration of electricity. I lost a couple of fragile personal items and when a shelf collapsed in a spare room which contains all my network associated gear my 2 TB NAS fell five feet to the floor. As it was operational the impact has most likely trashed the mechanical HDDs. The case impacted on a corner which ‘sprung’ the enclosure; I had to dissemble a portion to get everything back in place and then re-seated the two HDDs. However, while the unit will power up I never get beyond the flashing ‘initializing’ LED and the system will not recognize the NAS. I’ve pulled the two HDDs from the enclosure and will see if I can re-initialize them as standalone drives. Even with these losses I count us very lucky! The canines were really freaked out by the intensity and the duration of the main tremblor; the frequent aftershocks across the next ten hours didn’t help them regain their composure. This isn’t surprising as one aftershock was a magnitude 4.2 while another was a magnitude 5.8; either of these by themselves would’ve been noticed up here. I did notice my GSD (Qanuk) acting a bit flaky maybe a half hour before the main tremor; he was pacing and trying to get really close to me. While the latter isn’t all that unusual the former was different enough to grab my attention. None of the dogs liked the experience but Delilah, my newly adopted ‘Russian Bear Dog’ – more properly known as a ‘Caucasian Shepherd Dog’ – did shrug off the entire experience within a few minutes and was snoring again maybe fifteen minutes after the main quake. She did wake up for a couple of the aftershocks but only yawned, shifted her position a bit and went back to sleep. Please keep your hopes and prayers focused on the folks in the Anchorage bowl and the western Matanuska Valley and the southern Susitna Valley as they were hammered. Anchorage is again accessible by road but there is a lot of earthquake damage and it will take months and months to even begin to get repairs underway. Given it is late fall and snow is on the ground I don’t know how many of the destroyed sections of road can be repaired; perhaps they will only do temporary repairs until spring..? Thanks for everyone’s concerns! What has become a regular occurrence – if two years can produce a ‘regular’ anything – my college friend Sarge flew into Anchorage the last day of September to spend 17 days. He was a regular partner on my many trips to ‘The Great Land’ from 1996 through 2005 and drove the 26’ U-Haul van from SE Michigan to Talkeetna when I relocated in August of 2013. As such he has seen most of what I’ve seen in this majestic state so his visits since I moved up here have centered upon project work. Each year I assemble a list of projects which either require another’s assistance or are beyond my skill set; as Sarge is extremely handy when it comes to so many things he can usually handle my requests. Being a self-employed design engineer he is well suited to taking my requests and developing a ‘fix’ as well as implementing said ‘fix’. Thus when I began making noise about wanting a wood stove in my humble abode he figured it wouldn’t be too major an undertaking. In a perfect world such a project would most likely be a fairly straightforward proposal but as we all know this is anything but a perfect world and many aspects of this plan were under-rated simply out of ‘regional ignorance’. I had already picked out a compact wood burning stove at Moores’; the unit was ready such that the day after his arrival we drove to the store and picked up the stove. 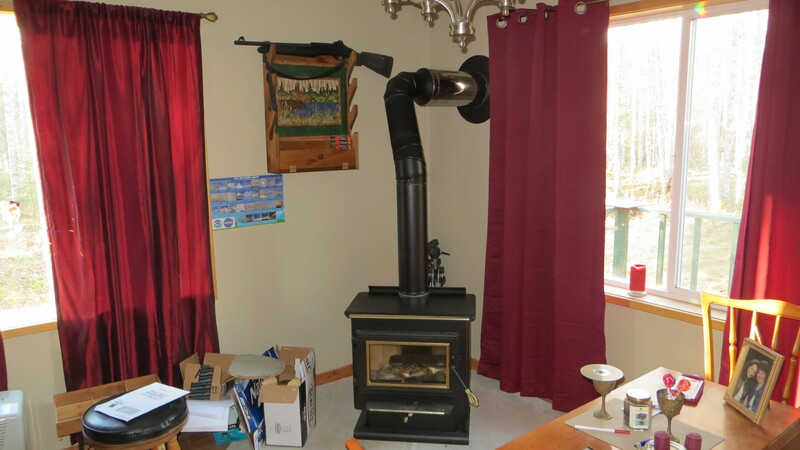 Initially things went well as we utilized the invaluable assistance of Shane at Moores’ along with Sarge’s skills to get the stove positioned and to get the hearth pieces cut and placed after which we did a more precise positioning of the stove. 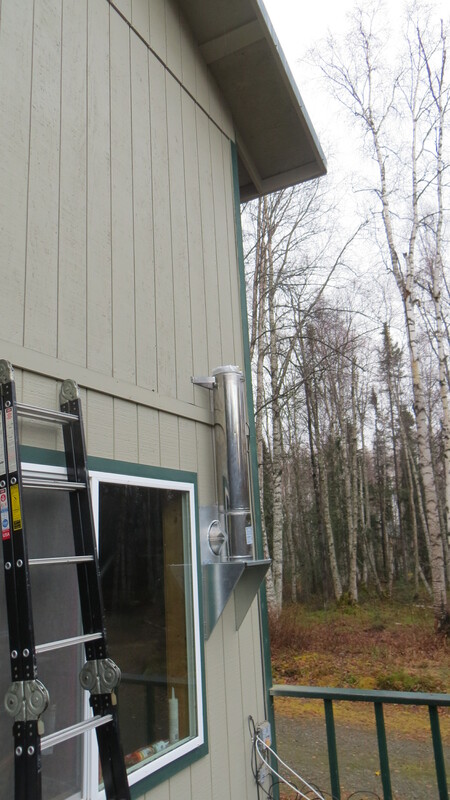 Then we went after the ancillary parts to pipe the exhaust from the stove through the exterior wall to the outside and run the piping to the second story roof. It was at this point things began to get ‘tense’. Interior Stove Install Almost Complete! I budgeted this effort at around $1400. 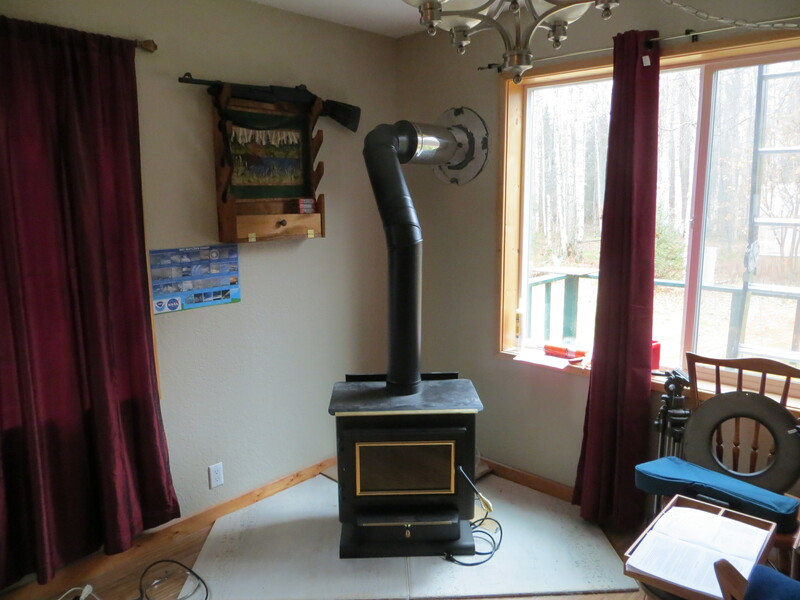 Hah; I quickly learned I was virtually clueless regarding the requirements of installing a wood stove in Alaska. Because of the potential for cold temps the piping not just inside but all the way to the cap just above the second story roof line needed to be insulated double walled piping. Ouch, the price differential between just single wall piping and double wall insulated is huge! This blew my pricing guess-timates right out of the water as while six inch diameter single wall piping is maybe $30/3 feet the double wall insulated variety runs around $90/3 foot section. Then I discovered the costs of all the additional pieces like the thimble, exterior support and the ‘T’ were far more than I had anticipated. Within a matter of days I saw this project pushing $2,000 and then Murphy decided to lend his five cents. We had hoped to buy a kit for all this ancillary stuff at Moores’; sadly they were out of stock and didn’t even have all the parts required in stock. We went on-line and found cheaper alternatives at Lowe’s but when we checked they showed out of stock at the Wasilla location and both Anchorage stores. We finally found a good deal through Amazon.com and placed the order on Sunday, October 4th. All week I monitored the order but there were no updates. In addition I sent two emails to the third party vendor inquiring as to shipping methods. As of Monday, October 12th Amazon.com sent me an email informing me they couldn’t verify anything about the order. I uttered a few choice words, emailed Amazon.com, canceled the order and sent in a blistering review regarding the customer service of the third party vendor. Sarge and I then visited Moores’ and picked up most of the parts in the kit; the operand word here is ‘most’. They were short two critical pieces and wouldn’t have them until Friday at the earliest. This was far too late so we purchased the items they had, beat feet home and went on-line. Mr. Murphy must have been chortling because only the Lowe’s on the south side of Anchorage had what we needed! We loaded up and left around 11:30 in thick freezing fog which thankfully dispersed just north of Willow as the air temp climbed to 40°F. The long trip was uneventful and we found the Lowe’s and then discovered they had the complete kit at a substantial savings over purchasing the separate parts. We purchased the kit and the other part we needed, jumped in the Escape, stopped at Fred Meyer and Costco and eventually pulled into the driveway at 17:55. A long day but we were feeling good given we had all the parts. Tuesday rolled around and so did the rain; initially just drizzle but strengthening to showers by daylight. Given most of the remaining work involved putting up the exhaust pipe from maybe five feet above the first floor all the way to just above the second story roof and a cut into said metal roof was required to allow the exhaust ‘stack’ to remain close to the exterior wall and thus supported we spent most of Tuesday awaiting a decrease in the rain. I took time off to fill in at KTNA for the noon newscast; when I returned Sarge had installed the exterior ‘T’, the stack support and one length of double wall insulated pipe as well. Only the increasing rain had stopped him from continuing on the exterior work. But the weather refused to cooperate and we had to be content working other projects indoors for the remainder of the day. Wednesday dawned mostly clear but some definite rain had occurred around 05:30 and everything was wet. As we awaited daylight the skies began to cloud up and weather radar showed showers moving in. I checked the NWS forecast and determined we’d be seeing rain by 11:00 which would probably last into the mid-afternoon. But the same forecast called for clearing overnight with continued clearing into Thursday morning yielding mostly sunny conditions with a high around 50°F. Given this we agreed to continue the outdoor work while it remained dry and managed to get three 36” lengths of the exhaust pipe mated, stabilized and sealed. This left us just two more pieces along with the cap but also still needing to cut the hole in the roof. We decided to switch off and finish some remaining projects while we awaited the forecast better conditions on Thursday. I was more than a bit concerned about doing so as I know how wrong weather forecasts can be up here but I also felt the safety factor was paramount and no one wants to work at the end of a 20’ ladder in rain while sporting an electrically driven ‘Saws-All’. Thursday dawned partly cloudy and continued to improve with the sunshine slowly warming the air but also encouraging a light breeze. Not to be put off we visited Moores’ around noon and rented a 24’ fiberglass ladder which we hauled back to my place and set up. It took Sarge two and a half hours to extend the exhaust pipe, cut a clean hole through the wood and metal roof, add the final piece of exhaust pipe, place the stabilizing ‘apron’ over the pipe and add the cap. 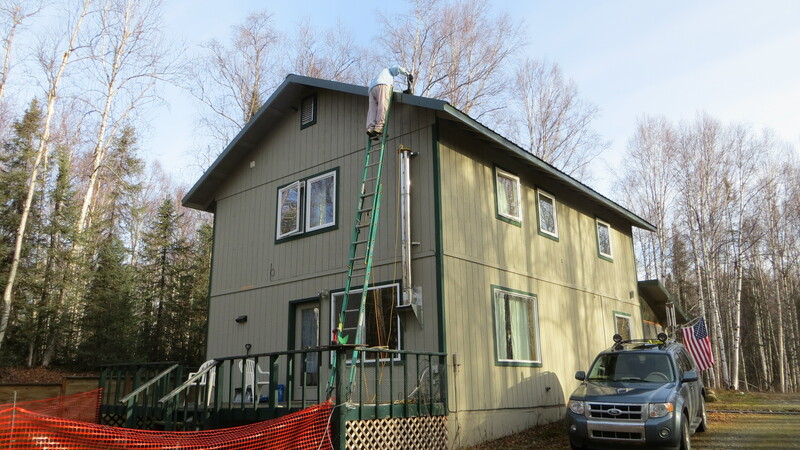 Then it was time to return the ladder and finish up some final sealing and cosmetic work in the house. By this point we were tired and agreed to wait until Friday morning to install the fire bricks inside the stove and test the whole thing. Friday was damp and drizzling so we definitely guessed right regarding the day to do the exterior work! The jigsaw puzzle that was installing the fire brick required a bit of thought but we soon had it ready to go. I assembled a small fire and attempted to draft the unit. Because it has ‘heat-a-lator’ piping in place there is no single large opening to the exhaust piping; this made trying to draft the set up difficult. I thought I had it and lit the fire; within a minute the main floor was awash in smoke! Thankfully I found my heat gun, cranked it up to ‘high’ and started heating the top interior of the stove. Within four or five minutes I had an upward flowing draft and could re-light the fire which this time drafted properly. It was a fitting end to see smoke slowly curling out of the chimney above the second floor roof line! The finished product ready for use! Most folks following this blog know of my fascination with meteorology and my expression of said interest by participating in volunteer functions like ‘Skywarn spotting’ and ‘CoCoRaHS’ (Community Collaborative Rain, Hail and Snow network) as well as reporting on the marvelous extremes of weather in The Last Frontier. I’ve always been a sky watcher and had learned to predict short term weather in the lower 48 just by observing the clouds and winds along with the barometric pressure. Since relocating to Alaska I’ve had to re-learn this knowledge as it is quite different this far north but I’m having great fun undertaking this re-education. CoCoRaHS Rain Gauge showing 0.33″ accumulated rainfall in previous 3.6 hours! I believe the aforementioned 1.44″ (3.66 cm) of rain across a 24 hour period is the largest amount I’ve recorded during such a time period since relocating to Alaska in September of 2013. Yet this rain is just the precursor to what could well be significant accumulating snowfall which NWS is currently projecting to begin in roughly 24 hours for this area. Everything depends upon the speed at which the very cold mass of Siberian air moves into the Mat-Su Valley; the faster this happens the more snow we will receive. If it happens sooner than forecast we could see over 6″ (15.24 cm) of snow especially at elevations above 1,000 feet (304.8 m) in the Susitna Valley with larger accumulations further north. If it arrives later then we’ll see more rain and less snow. I sympathize with the forecasting folks at NWS because so much affects the movement of such an air mass like pressure, upper level winds, lower level winds in the mountains and temperature. I am very concerned about the rain; given we’ve already seen 2.14″ (5.44 cm) since the event began Saturday evening and the rain is forecast to continue as moderate to heavy rain into Tuesday we could see amounts above 3.5″ (8.89 cm) across the period. Because the ground is already beginning to freeze the water cannot soak in as well and hence tends to pool and form torrents which can and do wash out the local road system. I am expecting to pick up a buddy flying from SW Michigan to Anchorage this Wednesday (09/30) evening and the only driving route to Anchorage is the Parks Highway (AK 3) to the Glenn Highway (AK 1). 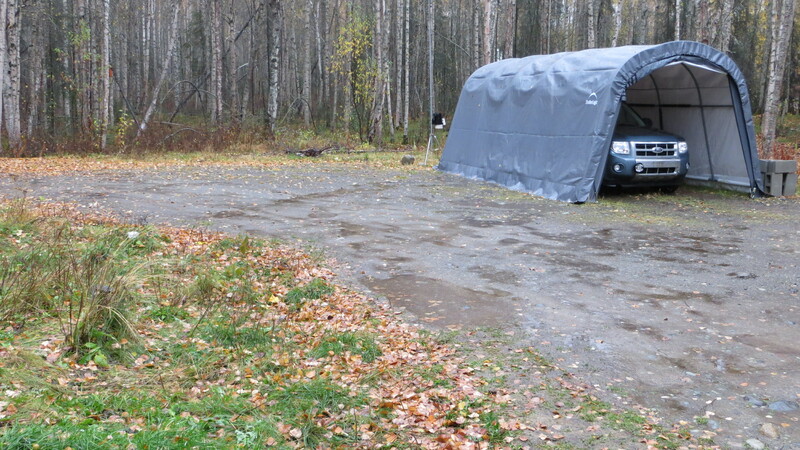 There are numerous areas along the Parks between Talkeetna and the intersection with the Glenn which have washed out in the past and these conditions are as extreme in terms of rain as any I’ve experienced in my 24 months living up here. I have driven the Parks in snow and ice but I’ve never had to negotiate washed out areas; at least that hadn’t been repaired before my arrival. I’ve never seen so much ponding water on my driveway! In fact I can never remember seeing any pools of water on the portion in this image!! It has been a while since I last posted on this site as my sister and brother in law visited me and we spent 18 wonderful days together during which I was privileged to show them ‘my Alaska’. I say ‘my Alaska’ because across the years I’ve discovered many magnificent places to visit which very few tourists even know exist let alone visit. 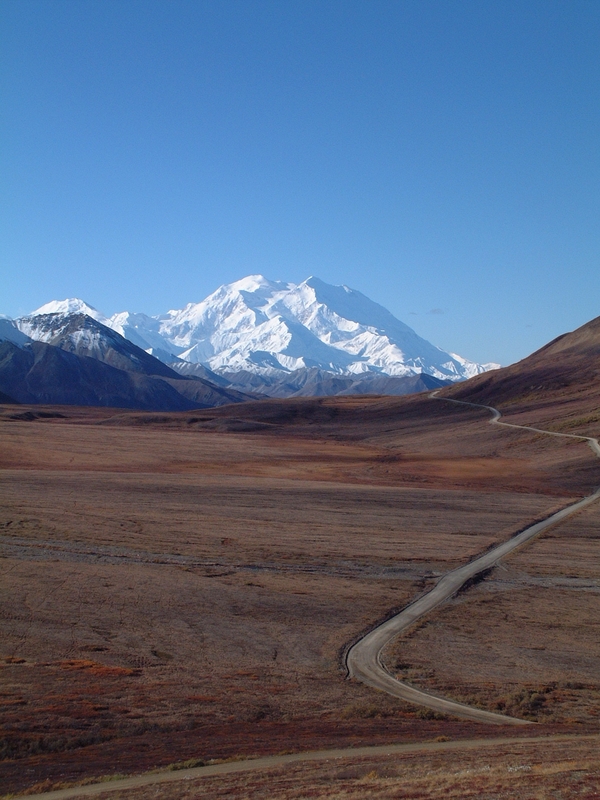 Examples are the Denali Highway (AK 8), Teklanika campsite in Denali NP&P, the west side of the Kenai Peninsula and the East End Road in Homer which is at the terminus of the Sterling Highway (AK 1). Both were mesmerized by these and other locations; the fact they’ve spent maybe 35 years living on the front range of the Colorado Rockies only highlights the majesty and awe-inspiring nature of ‘The Great Land’. I was sad to say ‘adios’ to them in Anchorage yesterday but also whetted their appetite for a return trip by explaining we still had the east side of the state to explore. Hopefully we will be able to do so in the near future. So now I’m once again able to post my thoughts and I find this initial piece will be a bit different from most of the previous. The nucleus for my post began to coalesce with my reading of an excellent tome titled “State of Fear” by Michael Crichton. It is an amazing read focusing on how ‘We the People’ are being manipulated by a consortium of political, legal and media special interest groups with a focus on the outright lies perpetrated by the extremists in the environmental circles. Without a doubt Mr. Crichton has his own opinions and some of his ‘science’ is both a bit slanted and outdated – the latter not his fault as the book was published in 2004 – but overall I found the book eye-opening to say the least. He makes it abundantly clear that the current ‘global warming’ disaster claims are based on shoddy and incomplete science at best and often employ fear-mongering along with political and economic pressures to produce the desired outcomes. If one doubts this I can only point to the fact that many of the websites and on-line postings he highlighted as support for his beliefs have since disappeared from sight. But I truly enjoyed his basic message which is; “Think for yourself, do your own research, question everything and do not just buy-in to what the lame-stream media or the current political party are spewing!” I’ve often railed about the average American being led around by their noses through the liberally biased lame-stream media agendas thinly veiled as ‘news’. Even these losers no longer try to claim they are ‘journalists’; indeed, we haven’t seen true journalism in these outlets since the early seventies. To me this should make it even more apparent to those of us who can remember the likes of Murrow and Cronkite – both of liberal beliefs, by the way, but unwilling to color their reporting with their own beliefs – that the current mass media outlets all have their own biases and use their programming to push said agendas. The purpose of ‘the Fifth Estate’ was to be a watchdog on the federal and state governments; given they now support liberal politics and smear anything else should not be lost on the American people. Imagine my surprise when yesterday I read a story in ‘Discovery News’ which spoke to the falsehoods behind the environmental extremists who have been shouting that polar bears will be extinct due to starvation by 2068 when it is forecast that the Arctic sea ice will be absent 180 consecutive days each year. Apparently a just released report from American Museum of Natural History now states that polar bears are much more adaptable regarding food sources than the wacko environmental extremists wanted us to believe. There is now reason to believe these bruins will learn to eat other food sources which will substitute for the seal pups they will no longer be able to hunt and kill in the absence of Arctic ice. Of course this will pressure the species and that is not good but their impending extinction so touted by extreme environmentalists as a clear sign of our impending doom will most likely not materialize. Do I doubt the climate is changing? Not in the least; the earth’s history shows the climate has been in continual flux since there was a ‘climate’. Do I doubt we are seeing warming temps? Living in Alaska this is abundantly clear and other world-wide data would seem to support this concept. Do I believe man is the main cause? By no means!! While I do believe mankind has contributed to the warming I remain unsure as to just how much. In addition I feel we know so little about the Earth’s climate over the past billion years we should not try to draw conclusions based upon a mere century or even a millennium of data. Only now are we beginning to learn of the effect of solar cycles on the Earth’s climate; the jury is still out on creeping shifts in the magnetic poles. I could go on and on but I believe I’ve made my point. Of late you may have noticed a dearth of postings on my site; there is a reason for this and said dearth will continue into early September. 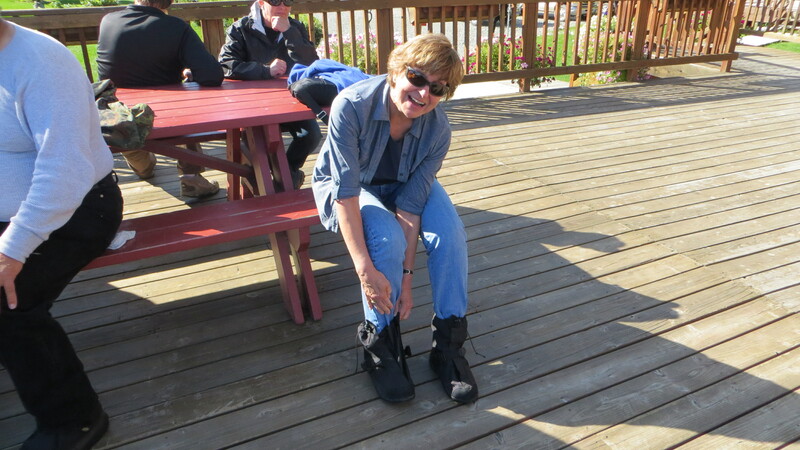 My sister and brother in law – Sal and Gene – are visiting Alaska for the first time. They began their travels with a flight from Colorado Springs (CO) to Vancouver (BC) where they boarded a cruise which took them up the Inside Passage with stops at Ketchikan, Juneau, Skagway and Glacier Bay before reaching Seward where they disembarked and spent a day visiting the sites. Then they took a bus to Anchorage, spent a day looking around and then boarded the Alaska Railroad and traveled up here. Since they arrived the weather cleared up and has been warm and dry; I told them they were welcome any time and that Alaska was smiling on them! 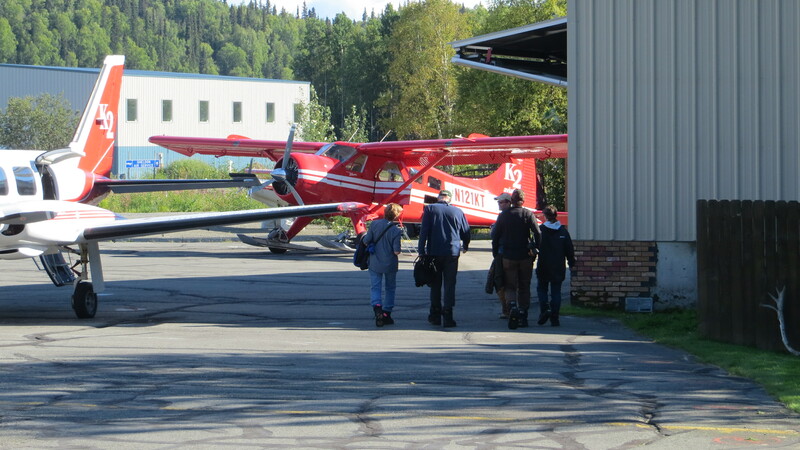 Since arriving they’ve done the ‘Grand Tour’ on a K2 Aviation Beaver which flew them among the peaks and valleys of The Alaska Range as well as landing on a glacier. We visited the Palmer-Wasilla area via the Hatcher Pass road, toured the National Tsunami Warning Center in Palmer (neat place and well worth the time), picked up great fish and meat at Mat Valley Meats in Palmer and shopped Fred Meyer before heading back to Talkeetna via the Parks Highway. I’ve driven them around the area and they spent Saturday morning wandering the village. Sunday they participated in my music show on KTNA; they gave their impressions of ‘The Great Land’ in general and of Talkeetna in particular in between music. Both were fascinated by live radio and really got a kick out of seeing their ‘little brother’ make it happen. They have walked ‘the Kidz’ multiple times each day and Sal is still trying to get a picture of the musher who takes her team up and down East Barge Drive on her ATV. 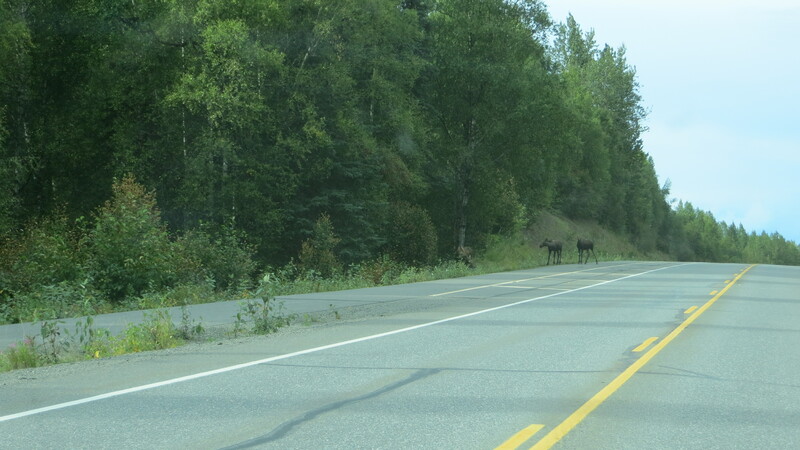 I’ve seen a bevy of moose but sadly Sal and Gene haven’t been with me but they did see a pair of moose in Hatcher Pass. I also caught a brief glimpse of a grizzly at Mile 2.8 of the Spur but once again they were not in the Escape. We finished baking six apple pies Sunday afternoon and gave one to my neighbor (Cathy); the remainder will go to Holly (my dear friend and realtor), the KTNA staff, the ‘ladies of the Talkeetna PO’ and another neighbor leaving one for us. I still want to introduce them to more folks around town and get in a Mahay’s Jet Boar ride up the Susitna River. Wednesday we drive to Anchorage to pick up a RV; we’ll return here to load it up and then head north to the Denali Highway. As pets are not allowed in the rental RV Mark will live here in our absence and handle ‘the Kidz’. We’ll be in Denali NP&P from Friday through Sunday and then most likely drive into the Kenai and visit Homer and the immediate area. Then we turn in the RV the next Wednesday and we’ll have another four days here before they depart. All told it has been a wonderful visit to this point and it there’s no reason to assume it will not continue to be great. I am hoping they will get to see wildlife on Saturday when we take the bus in the Park to Wonder Lake. At least they’ve already had a chance to see The Alaska Range in general and Denali, Mt Hunter and Mt Foraker in particular from Talkeetna so even if we don’t see ‘the Mountain’ in the Park it will be okay. I’m also hoping for more moose views around here and in the Kenai and I remain hopeful they will get to see some grizzlies in the Park as well. It has been a fantastic visit to this point so here’s hoping for more of the same! I will be back to blogging on a more regular schedule come early September. Here’s wishing everyone a great remainder of summer and a colorful upcoming fall..! 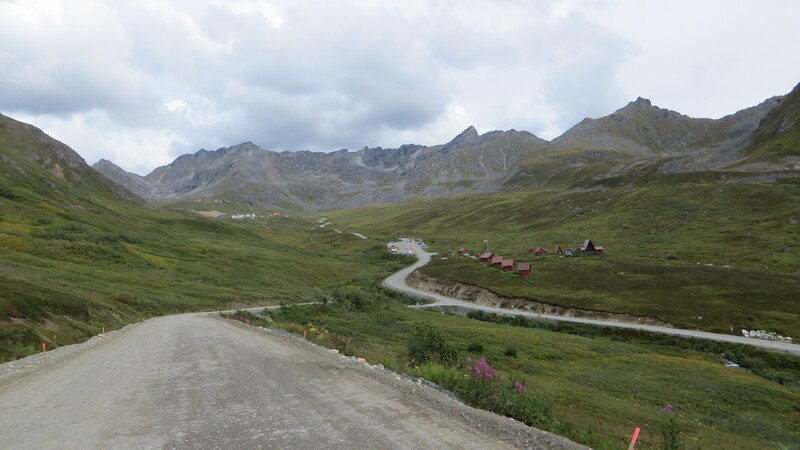 Hatcher Pass mine and vista! The past couple of evenings I’ve been able to lie awake in my bed and listen to the sound of rain tapping on the metal roof. I’ve always loved this sound but I really enjoy it now because of the metal roof; it truly brings out the sometimes steady and other times not so steady drum of the rain drops. Given the dearth of precipitation this past year the soothing sound of rain drops striking the roof are truly appreciated. But there is even more to love about this sound as it signals an easing of the drought conditions in this area and is assisting the firefighters in their heroic efforts to control the wildfires of Alaska. Although it truly took a while Mother Nature has finally seen fit to bathe this area in some much needed moisture! 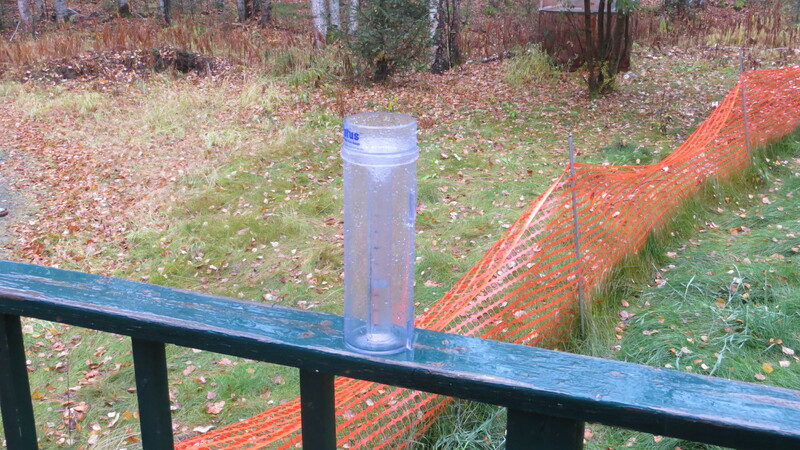 Across the past two days I’ve reported 0.94” of rain to CoCoRaHS (Community Collaborative Rain, Hail and Snow network) and while July is the third wettest month of the year in Talkeetna we now have 2.41” of precipitation. Given we’re just 18 days into the month and showing 2.41” we’re 67% of the way to the normal rainfall total with 13 days remaining so with a bit of luck we might make the average rainfall total for July. If this happens it will be the first month in 2015 that we’ve reached or exceeded the monthly rainfall amount. 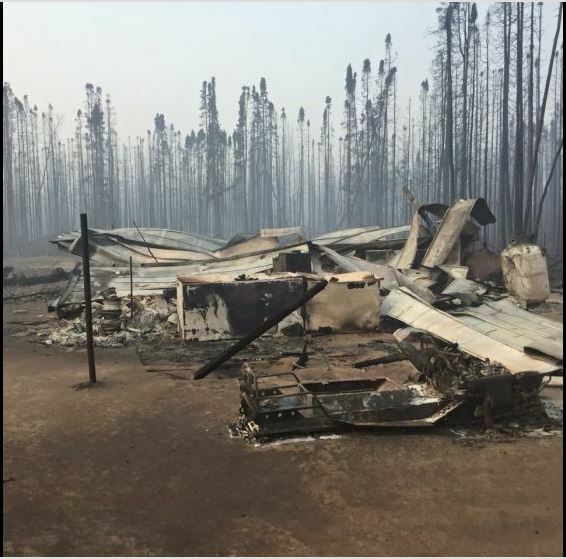 Sadly this is a bit late for the victims of the fires in June and early July and comes on the heels of more information released about the inexcusable stupidity and utter disregard for safety displayed by the perpetrator of the Sockeye Fire, one Greg Imig, along with Amy Dewitt whom both live in Anchorage. No, they have yet to be arraigned but Imig reportedly confessed to burning trash on that fateful Sunday morning which quickly escaped his control and began what would become the Sockeye Fire. The couple claimed they called 911 when the fire was already out of containment but they gave no location or their names. In addition, they apparently left in huge hurry leaving a chainsaw, gas cans and jack pads for a motorhome behind. Spent fireworks were found at the scene but they are not believed to be the primary source of the fire. But there is more to this story that provides damning evidence regarding the utter negligence of this duo. Imig was apparently an on-air meteorologist at one time; given the conditions that Sunday morning any rational person would have recognized the utter stupidity of having open fires but a meteorologist should most definitely have known better. There were Red Flag warnings all over the state and any sensible person would have realized the immediate danger of any open flames. Yet this individual decided to ignore common sense and all the warning and burn open brush piles..?!?! Because of this pair’s rank idiocy 55 dwellings were destroyed, many more damaged, an uncounted number of animals threatened and some apparently killed, hundreds of acres of boreal forest incinerated, multiple forced evacuations were implemented and hundreds of firefighters risked their lives spending days fighting a completely unnecessary fire. Because we are a country of laws, or were before the recent administrations decided they know better than our founders, this must be allowed to play out in our court system. Somehow I have a feeling the real pain for these incomprehensibly stupid people will come in the form of the soon to be filed civil actions. This is how our system works and we need to allow it to take over and proceed. Assuming this pair is to blame, and with Imig’s confession of guilt it seems a given, they should feel the full weight of the legal judgments against them. All of us wonder why someone would undertake such dangerous actions in the wake of so many warnings; it just seems incomprehensible. Sadly, I fear this is yet another example of the PC driven solipsism that seems to be sweeping the world. So many people are so powerfully inculcated to just live within their own heads and serve only their own interests and needs; we’re becoming a culture that almost refuses to look outside ourselves. In such a scenario if one wanted to ‘enjoy’ burning trash and debris then just do it; such individuals never even consider the potential consequences of their actions except as it might affect themselves. Perhaps if our numbers were just tiny fractions of what they are currently we could get by with such a mindset but this is not the case. Human beings tend to live in groups and as such it becomes necessary to not just think about one’s own needs but to think also about the good of the group. Yes, this does require more effort, at least until one trains one’s self to automatically figure the group’s needs and safety into one’s mental calculus, but it is necessary for people to exist in close proximity and especially in large numbers. Yet paradoxically, as we continue to increase our numbers, a large portion of us put ourselves ahead of all others and continue to be focused upon just our own wants and desires. This trend is not something that is wise yet somehow we have generations of folks who follow its path; often to the detriment of their fellow human beings. Perhaps we are reaching a tipping point of sorts when we must all sit back, take a deep breath and look into ourselves with as much objectivity as possible and ask; “Am I really concerned about the needs and safety of my fellow human beings?” After all, in the end we are all the same and in this together. Personally I’ve found I have no choice but to accept assistance from others and this only increases as we age. Maybe it is time to really evaluate just how much empathy we have for our fellow human beings? Living in Alaska one of the things I truly admire is what I call ‘the fierce sense of freedom and independence’ so pre-eminent in so many of the people. But along with this comes the undeniable acceptance that at times we all need a hand. Alaskans in general manage to balance this so very well; we cherish our independence and freedoms but we are also among the first to offer assistance to those truly in need. In this sense the lower48 and, indeed, the rest of the world could learn a bit from those of us who call ‘The Great Land’ our home. Alaska has an amazing way of demonstrating just how little real ‘control’ we humans can exert upon this awesome state and yesterday we saw another humbling example of this truism. My friend Mark stopped in around 14:30 and told me a wildfire was burning to the south around Mile 78 of the Parks Highway. 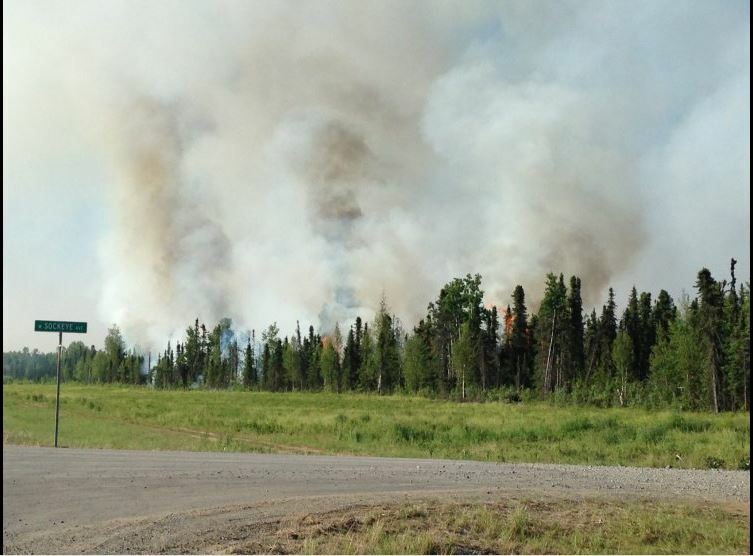 We immediately turned on the television but had to wait until 17:00 to get an Anchorage newscast; from it we learned a wildfire was burning out of control along the western side of the Parks at Mile 76 and had jumped the Parks Highway and was now burning along the east side as well. The state troopers had closed the Parks at Mile 78 to any traffic south bound; they were also diverting folks trying to drive north. At that time the fire was believed to be about 30 acres in size. Around 17:20 we decided to make the 7 mile trip to Cubby’s – a small grocery store – at the intersection of the Spur and the Parks Highway. As we approached the entrance to Cubby’s from the Parks we could see a huge cloud to the south along with the upwelling of ash brown smoke. 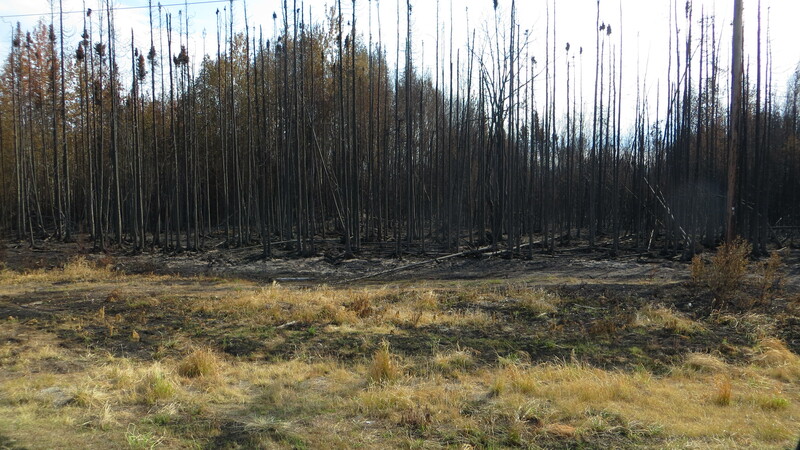 This was our first glimpse of what was to become the Sockeye Wildfire. The parking lot of Cubby’s was filled and inside it was a mess; many locals and tourists didn’t even know there was a fire and those that did were scrambling. The RVer’s were buying anything they could grab and many tourists in cars were panicking because they needed to get south. Few people had even the scant information we possessed so we disseminated what little we knew to the crowds. Upon finishing our shopping we headed back to the Spur; in so doing we saw a trooper parked on the side of the road stopping folks southbound on the Parks. They were allowing anyone access who lived at Mile 80 or further north; all others were being diverted to Talkeetna or asked to head north. Driving north on the Spur I saw three large Princess Cruise Lines buses pulled off on the side of the road; I’m sure they were trying to figure out what to do. As tourist season is in full bloom most of the rooms in Talkeetna were occupied and I’m sure by Sunday evening there was no lodging to be had in the village or outlying areas. Our weather was about the worst it could be with blazing sunshine, an air temp of 84 F along with 30+ mph northerly winds and a relative humidity of just 22%. Sadly today is the same but as of 13:12 AKDT the outdoor temp is already 84.2 F with just 26% RH and 25+ mph northerly winds. Given our maximum temps are now occurring around 20:00 we will most likely set a record with temps near if not exceeding 90 F. Because of the northerly winds this area is safe; in this sense we are extremely lucky. But the fire continues to burn out of control and within a bit over 12 hours it has grown from just 30 acres to more than 6,200 acres; that’s an increase in size of almost 207 times!! The Parks is currently open but is just one lane through the Willow area and vehicles can only drive this area when led by a pilot car. Given the usual amount of summer traffic on the Parks coupled with a very busy tourist season there are a lot of rightly worried people. Sadly many tourists are getting a taste of what it is like to live in Alaska! 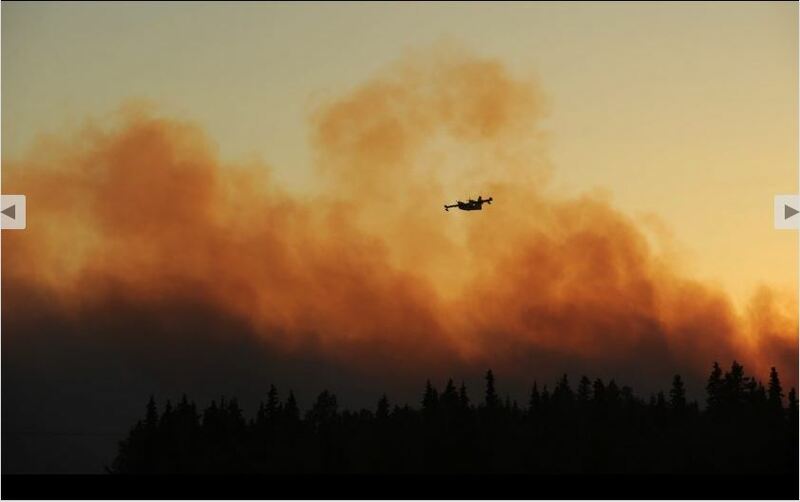 The tenuous hold we humans have in ‘The Great Land’ is highlighted by this fire; in just 24 hours the blaze has cut the only road from Anchorage and the Palmer/Wasilla area to the interior and is destroying homes and properties. Normally the state allows wildfires to burn uncontrolled unless lives or property are in danger; in this case they are working feverishly to contain the fire. Six ‘hot shot’ teams were flown in from the lower 48 last night and are on the fire lines along with every available firefighting team from the state. As of this writing it has spread to the outskirts of the Nancy Lake area which is large and densely populated – at least by Alaskan terms – with expensive homes, summer cabins and lots of docks with lake access. Just to the SE is Houston; it really lies at the northernmost reaches of the Wasilla area. These folks are being evacuated as are those in the Nancy Lake area. Alaskans know Mother Nature will largely do as she will and there’s little we can do about it but go with the flow. But we can support our neighbors and do all we can to help them not just survive this disaster but also rebuild. For the near term just trying to organize to assist them is a huge chore; no one knows just how much work will be required in the future to help them re-establish their lives. Not that most of us needed the reminder but we humans exist in this majestic state at the benevolence of Mother Nature; as such we must always remember she can be a fickle landlord. Please say a prayer for all our neighbors to the immediate south and for all the brave firefighters!